As we’ve discussed in the past, one of the best things a home buyer can do is shop around for loans. Doing so will help you to be the most informed buyer, and ensure you’re getting a loan that suits you and your financial situation. We know there are many different places to obtain a mortgage, from national banks to local lenders like ourselves. With so many options available, we’d like to take a few moments to discuss the benefits of choosing a local lender. 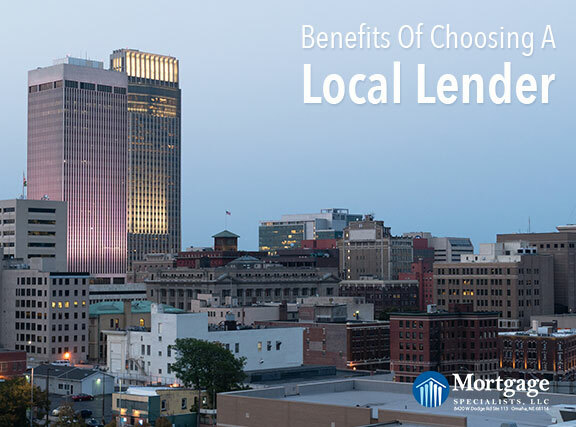 Choosing a local lender means your lender has a reputation in the area. You may be wondering how your lender’s reputation can affect your loan, but you’d be surprised. The housing market is very competitive right now, meaning many homes are receiving multiple offers. Seller’s agents are more likely to steer their clients toward an offer that comes from a reputable source because the loan is less likely to fall through. Here at Mortgage Specialists, 99.9% of the pre-approvals we’ve ever given have closed. We’ve been helping people in the Omaha area get mortgages for nearly 20 years, meaning we’ve met and worked with many realtors in the area. Not to mention all the realtors we’ve met working with committees and associations like the Omaha Area Board of Realtors. By choosing a local lender, you’re choosing to have a more personal experience. Unlike some of the larger banks, you’re able to meet with your lender face to face to discuss your options. While phone calls and emails are fine and necessary means of communication, sometimes an in-person meeting is best, especially when discussing more complicated items like the terms of a loan. Providing our clients with excellent service is something we pride ourselves in here at Mortgage Specialists. We’re a small family of mortgage professionals, meaning you’ll probably speak with each of us throughout the mortgage process. Since each of us will likely touch your loan throughout the process, we’ll be able to provide you with answers pertaining to your particular loan, instead of receiving generic answers. We also know how important it is to be available at all times for questions, including nights and weekends. But don’t take our word for it, see what countless clients have had to say about working with us. In our opinion, choosing a local lender just may be the best decision you make in the homebuying process. Are you ready to buy a home? Give us a call at 402-991-5153 to get started today!